this is the part where i'm supposed to say that it's bittersweet, but that would be a lie. yes- i will miss a couple of my co-workers fiercely. but that is not a reason to stay. for the last six months, i have felt like i was drowning. just when i thought i could breathe, another wave would come crashing in. work became this place where i was just trying to survive. i could list all the reasons why, but that's not my style. simply put, i was giving my all and then some in exchange for chump change. when i started this job three years ago, i proudly walked in the house one night after work and declared that i was going to retire from that place. i loved my job, the clients, everything. shortly after i was hired, i received a promotion. in hindsight, that's where it all started. when i started job hunting in late spring of this year, i had daily emails of open positions for bookkeepers, but nothing that looked promising. i started to feel hopeless. i casually mentioned this to jared a few weeks ago, and he quickly replied, "that's when a breakthrough is about to happen." little did he know just how right he was. while at work on a saturday (ugh), jared texted me that a local credit union had just posted an opening in their accounting department. i had previously worked for the company as a bank teller, but quickly realized accounting was my first love. i applied immediately. the following monday, i received an email asking for an interview, which happened on wednesday. the next day, i was asked back for a second interview. i found that promising. at the end of the second interview, we wrapped up the questions, and they looked at me and said, "we want to hire you." WAIT WHAT. guys. this job comes with a big pay increase plus benefits! it's huge for our family. God was faithful to provide this job. i never lost faith- even if it was the size of a mustard seed. i asked Him when this process started to either change my heart or change my situation. He did both actually. but there's another part to this story that i need to tell. i put my two weeks in yesterday. the reaction was expected. i was asked that my last day be today. i agreed. i had another week before i could officially start my new job, so i wondered how that would affect our finances. nonetheless, i knew we'd be okay. but God went before me and made a way before i even had a chance to ask. i got back to my desk and saw an email from my new employer confirming my start date. she mentioned i could start next week if need be. PRAISE HIM. - he loves my parents' land. - i survived the tax deadline on monday + celebrated with chick-fil-a. - i had a prayer answered in a big way this week. i can't say anything just yet [not pregnant] but it is huge for our family! - we took a short overnight trip to oklahoma to visit my family. jackson had a blast running around my parents' property and soaked up all the attention. - i was telling jared how stuck i felt in a certain area of my life. he told me that meant the breakthrough was about to happen. he had no idea just how right he was! if you're feeling stick, like there's no hope of your situation changing, i'm confident that God will either change our hearts or change our circumstances. - there is something about going back to oklahoma that resets my soul. in the late eighties, president ronald reagan proclaimed the month of october as national pregnancy and infant loss awareness month. in the mid-2000s, october 15th became pregnancy and infant loss remembrance day. if you've experience this type of loss, you don't need a day to be reminded of such a thing. the loss is forever woven into my life, and i will never, ever forget. three months later, there are still little reminders of our baby. we would have found out the gender of our baby this month. i found my maternity leggings while i was unpacking last month. knowing my arms will be empty come next spring. and several other reminders that come out of nowhere and sting all over again. i assumed they would fade over time, but i know now that i will always carry it with me. when i'm ready, i will give our baby a name. not for closure- that will never happen- but because there was a life growing inside of me, if only for nine weeks. naming the baby acknowledges that short life. and though that life never lived outside of my womb, it was still a life. i remember growing up and knowing that my mom had experienced a miscarriage before she had my brother + i. her loss, that pain - it never truly became real until the moment i called her to tell her that i had miscarried my own baby. she wept with me over the phone and told me how it brought up the painful memory all over again. it's something she's carried with her for over three decades. i know i will, too. the only comfort in this process has been Jesus. He will be the only comfort going forward. if you have experienced a loss, know that you are not alone. the Great Comforter is holding you in His arms. He provides peace that surpasses all understanding. - saw these pretties on my evening walk. - slow mornings with a sweet cuddle bug. - he's growing so fast. - i made a cleaning spray with my thieves sample that came with my YL starter kit. i was skeptical of it, to be honest. but - yet again - it surprised me. the top of our stove is sparkling clean now! i also cleaned our bathroom with it, too. - jared worked a split shift on thursday and friday, which meant we got to drink coffee together before i left for work. - the october deadline for taxes is next week, so i was insanely busy at work this week. i clocked in several hours on saturday to help out. it reminded me that in a few months, i'll be working sixty hours each week during tax season, and... dang- that got depressing real quick. - it snowed on sunday night. in october. what the heck?! - jared + i were reflecting on how jackson is growing so fast. we thought of the times we would wish for the next season, the next milestone - only to miss the current phase once it was gone. - i have really enjoyed finding new recipes to make for dinner during the week! - i picked jackson up on thursday because of jared's shift, and it reminded me of when i did that every work day during second shift. - reading anne bogel's new book, i'd rather be reading. - that kid loves playing outside! - labor day was spent quietly at home, which was very welcomed after such a whirlwind summer. - i had an hour + a half before an appointment one morning, and i spent every minute browsing target + drinking a latte. it was BLISSFUL. - once jackson started walking, he has been non-stop on the move. he has no time to cuddle with mommy. i left for work on friday morning and asked him for a hug. he usually runs away laughing because he knows i'll come chasing after him. but this time, he walked up to me with arms open and gave me a hug. my heart could have burst out of my chest. - we usually have no trouble putting jackson to bed at night, but saturday night was out of the norm. he was crying and crying, so i gave it five minutes, and finally went in to check on him. i picked him up and sat in the rocker for about ten minutes just holding my baby boy. i cried some happy tears because - as i said before - i never, ever get to cuddle with him anymore. jared peaked in to see what was going on, and he smiled really big and knew that it was exactly what i needed. - jared + i had the perfect sunday afternoon. we lounged outside, sipped coffee, and enjoyed the incredible weather. once jackson woke up, he played and we took him to the park. we ended the day with a game night with friends. our sundays are usually so hectic, and this was just what my soul needed. - i loathe grocery shopping because i always, always forget something. [yes, even when i make a list, there's always something.] but this week, i was determined to change that. and i did! what i found most helpful was putting pen to paper + writing out a meal plan for the week. - i have never read a book twice, and that's okay. there are too many books on my TBR list. - i took anne bogel's reading personality quiz. i tested as "the escapist" + that is very accurate of my reading life. - our childcare situation changed this week. real talk: i could not see how God was going to work it out. jared was so positive, and i just wanted to wallow in myself. we received the news right before church started, and i sat through the entire service feeling sorry for myself + telling God there was no way this would work out. i was so caught up in the circumstance that i couldn't remember all the times He HAS provided. and guess what? by the end of the service, He DID provide. jared's parents start watching jack next week. not only was it an answered prayer for us, but it was for them. they're retired and could definitely use the extra cash. God saw my distrust and still made a way. i don't deserve His kindness, but He has really been doing a refining work on my heart as of late. this song has constantly been playing. - jackson loves his new bedroom. - started reading a new book. - i was organizing our bedroom while jared was watching jackson in the living room. or so i thought. i walked into the bathroom to find jackson covered in water. IN TOILET WATER. - i caught a lovely summer cold mid-week. dayquil has been my best friend. - i finished reading theeeeee cutest book - since you've been gone. - celebrated thirty-two with banana cupcakes, date night, + lots of love from my people. - had a game night with our neighbors/family. - part one: our son thinks playing in toilet water is a good time. part two: make sure the bathroom door is always closed. - banana cupcakes are so delightful + i have the best co-worker who surprised me with my favorite dessert! - it's unofficially officially fall in my opinion. + 2017: august: a month in review. + 2016: farewell to my twenties. 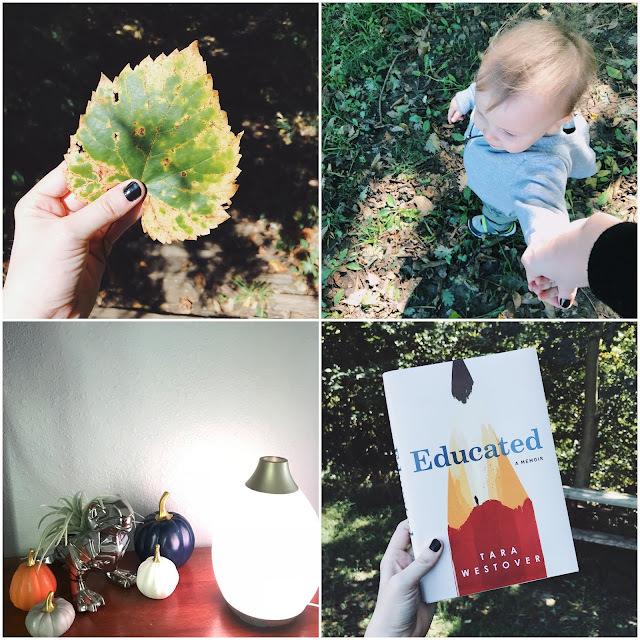 blogtember: day one. blogtember: day two. august 2016. + 2014: on setting goals. september goals. blogtember: day one. blogtember: day two. august 2014. + 2013: twenty-seven. twenty-seventh birthday celebration. don't quote me on that. a happy list. 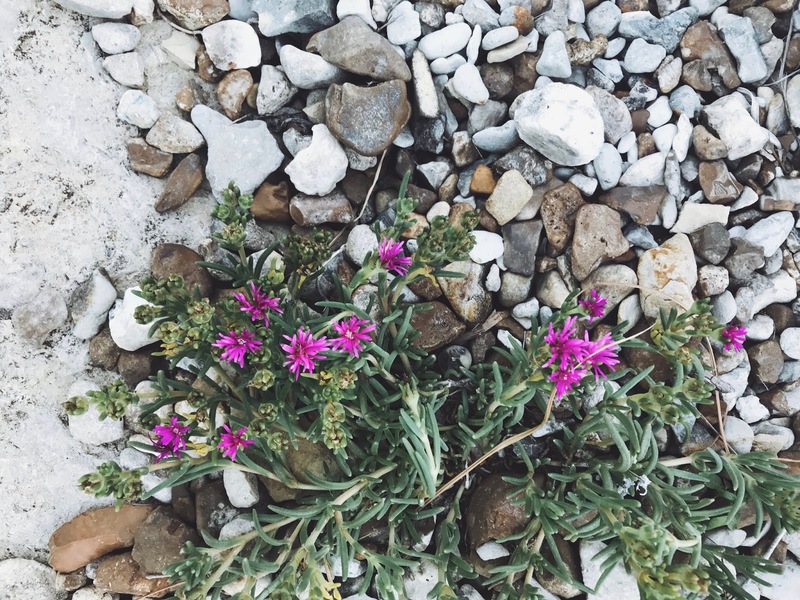 the weekly: august 20th - 26th. - while unpacking, i found my grandma gracie's bible. - salted cream cold foam cold brew. it's legit, y'all. - i might be in love with our new appliances. - jared finished up the trim work, and i am alllllmost finished unpacking the last few boxes! - i made dinner while jackson played in the next room. these little moments are so delightful. - i worked late one night and didn't get home until 8:30. jackson greeted me with a huge smile, and i melted. - finished glass sword on audiobook. i'm just not very into this series like i thought i'd be. - we had zero plans on friday night, and it was GLORIOUS. - my family came up on saturday. we celebrated my birthday early with shopping + dinner at rib crib. - sometimes i need to lay aside my pride (okay, all the time) and get the job done. i have been stubborn about some things at work, and it's benefiting no one- myself included. - i tried new shampoo + conditioner recently, but switched back to my favorites. i have never loved a shampoo scent more! - in case you're wondering my myers-briggs type, i'm an INFJ. it's supposedly only makes up 2% of the population, but a majority of my blogging friends are INFJs. - as great as personality tests are, they don't define me. i won't use them as a crutch for poor behavior. -but- it is fun to explore and use as a tool to better understand someone. - make sure to pick up any rogue toys because jared may trip over one as he's leaving for work at 4:30 in the morning, causing oneself to run through the house whisper-yelling BABE, BABE. what did i think i was going to accomplish by calling an intruder babe? - i was just about to give up on these weekly posts when i realized that i have come to loathe the monthly recaps. 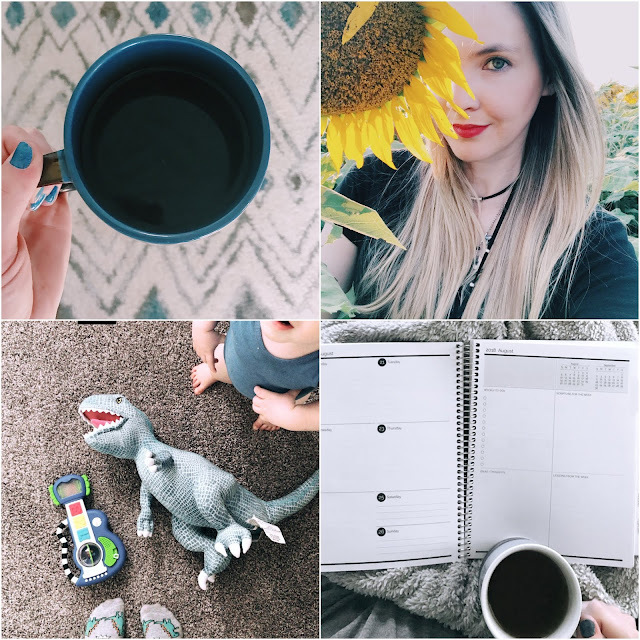 i always forget to update the post weekly so that i'm not sitting with a blank page on the last day of the month- when it dawned on me: why not just write a weekly recap? having my new agendio planner really helps because i use it as a planner/journal/memory keeper/catch-all. - i reflected on the year jared worked second shift. jared sent a text earlier this week letting me know that he had a meeting with his bosses, and it was possibly about transferring back to second shift. i felt a surge of worry start to build up in my mind, but i quickly reminded myself of truth. it got me thinking about when jared was on second shift for a little over a year. the first few months when jared was on second shift weren't too bad. i spent the evenings nesting and binging parks + rec. i'd go grocery shopping on monday nights by myself, which was oddly glorious. once a week, i would take him dinner, and we would eat in the parking lot at his work. looking back at those weekly parking lot dates, i realize how important they were. the hardest part of second shift for us was the lack of quality time together. on a good day, we saw each other for a total of an hour. but on the bright side, effort was made on both sides. he woke up before i left for work to make me a cup of coffee; i stayed up to chat while he got ready for bed. when he had the night off, we would go on dates or hang out with friends. after jackson was born, we sold our house + bought another one. maternity leave was definitely not this relaxing time off i had envisioned before having a baby. [how naive i was!] most of the time, jared was working on the new house, and i was just trying to keep my head above water. once we both started back to work, it was so, so different than before jackson. this might sound crazy given my initial reaction of jared's transfer, but second shift was easier after jackson was born. maybe it was because i had someone to take care of + keep me company while jared was at work. or maybe having those two months of evenings to myself prepared me for what was to come. whatever the reason, i was surprised at how much i liked it. our park city home was a season of transition for us. it saw us through so much growth. i don't think it was a coincidence that jared was finally transferred back to first shift when we decided to sell that house. i realized it served it purpose for us when we signed the papers at closing and saw that we made a little money in the process. jared texted me right after his meeting - no transfer. i was relieved. had it become our reality, we would have been okay. but i reeeeally love coming home after work, walking in the door, and seeing jared + jackson playing together on the floor. the weekly: august 13th - 19th. - saturday mornings are becoming my favorite. - unpacking with the help of jackson. - MONDAY: began packing up some of our things + started a new audiobook. 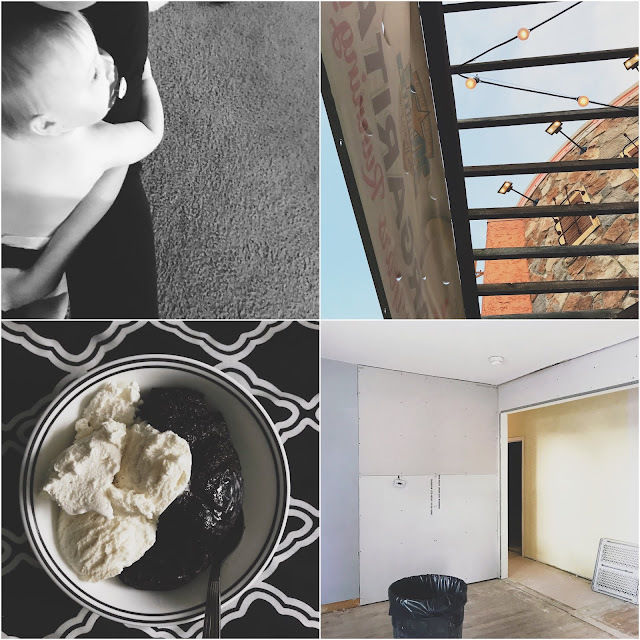 - TUESDAY: WE FINALLY MOVED INTO OUR HOUSE. CRYING ALL THE HAPPY TEARS. - WEDNESDAY: my favorite podcast mentioned my listener confession on today's episode. - THURSDAY: my niece + i had a photoshoot at a sunflower field + i almost died from excitement. - FRIDAY: i finally got my new agendio planner in the mail! it's the little things, y'all. - SATURDAY: lots of unpacking + ended the day with a birthday party at the splash pad. - SUNDAY: spent the afternoon cozied up, planning the week, + drinking tea. + always a good reminder. + 2015 was a fun summer. 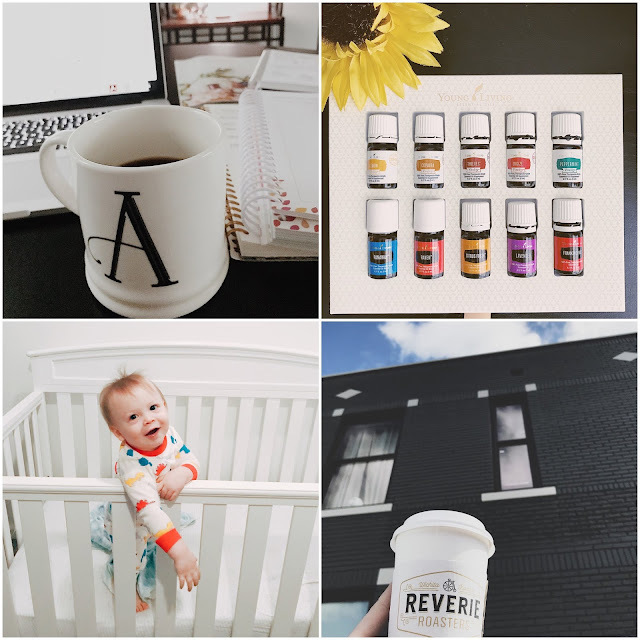 + one of my most popular posts: 26 before 27.
the weekly: august 6th - august 12th. - jackson loves to read. and by "read" - i mean he likes to flip through every page really fast. - shopping on saturday morning for house supplies. - my coffee mug matched my socks. - MONDAY: jackson loves to go shopping with mama. he waves at everyone and says hhiiii. - TUESDAY: finally getting caught up at work. a lot of stress was lifted when i started reminding myself of truths. - WEDNESDAY: i started listening to my first audiobook, big little lies. it's free with my state library e-card! - THURSDAY: jackson + i played all evening while daddy worked on the house. - FRIDAY: spent the evening painting + listening to an audiobook. - SATURDAY: we worked on the house most of the day. it was a really good day. + i remember writing this post last summer while jared fixed a broken toilet at 11pm. + five year later and half of these have changed. + LOL to when i used to post my monthly goals on the blog. + i still love my city! + i absolutely, weirdly LOVE vacuuming. i would vacuum every single day if i could. + i'm ride or die for the oxford comma. + i placed third in my fifth grade science fair. my project was color changing roses. + i am the worst gift wrapper. + puns, dad jokes, + sarcasm are my jam. + i always wait to pack until the last minute. like literally- the day of jackson's birth, i packed my hospital bag. + i used to silently judge people who used e-readers. and then i had a baby. now i'm a proud kindle owner. 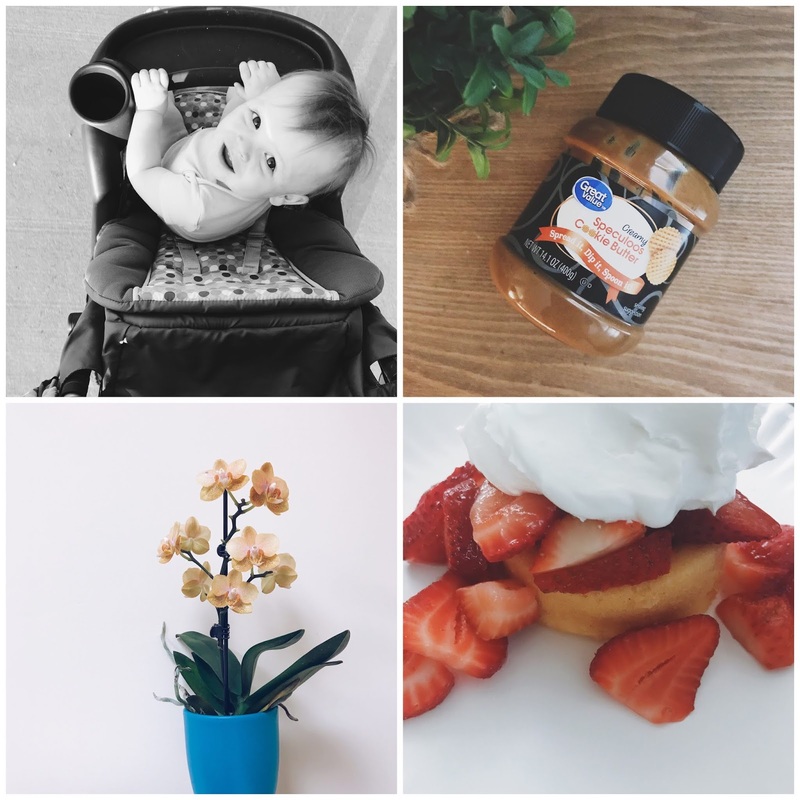 the weekly: july 30th - august 5th. - this kid loves evening walks. i play worship music + walk around the neighborhood before his bedtime. - YOU GUYS. run to walmart right now and buy this cookie butter. - we have received sweet little 'thinking of you' gifts from friends lately. - dessert from my mother-in-law. - MONDAY was my first day back to work. it was hard, but i did it. - i spent TUESDAY night painting over at the house. - i started reading "why i hate green beans" on WEDNESDAY. - jackson + i enjoyed a peaceful evening on THURSDAY with a walk + extra snacks. - i had a rough day at work on FRIDAY, but it ended well with strawberry shortcake. - SATURDAY was so glorious. i did housework + hung out with jackson all day. - we worked on the house for a couple hours on SUNDAY while jack napped. + i am considering another polaroid project for next year. here is the 2014 polaroid project. + i shared my bullet journal two years ago on the blog. i recently purchased an agendio planner. i'm SO excited! i was listening to a podcast about miscarriage yesterday. i wasn't sure if i could make it through the episode without breaking down, but i figured all i had to do was hit stop if it became too much. a half hour later, i finished it having not shed one tear. later in the day, i listed to another podcast about knowing when to have more children and when to stop. two of the ladies announced their pregnancies during the episode. when asked their due dates, one happily said february. and my heart sank. my due date would have been february 24, 2019.
little reminders of this loss + pain + grief have randomly caught me off guard and break my heart all over again - like walking by the third bedroom that was supposed to be the nursery next spring, or seeing my prenatal vitamins sitting on my desk at work, or finding the screenshot of the ultrasound picture of our sweet baby. it's getting easier, but i'm learning that i will always carry that loss with me. i woke up an hour before my alarm was set to go off this morning. very rarely does this happen, but when it does, i know it's the Lord. i got out of bed, washed my face, and opened my bible app. after some searching, i landed on a devotional about miscarriage. the passage for day one is lamentations 3:19-24. 19 - the thought of my suffering and homelessness is bitter beyond words. 20 - i will never forget this time, as i grieve over my loss. 22 - the faithful love of the Lord never ends! His mercies never cease. 23 - Great is His faithfulness; His mercies begin afresh each morning. 24 - i say to myself, "the Lord is my inheritance; therefore, i will hope in Him!" i have read verses 22-24 countless times, but never have i particularly noticed verses 19-21. the Lord showed me that my suffering, my grief, my loss - it's okay to feel it deeply. it's okay to mourn + cry + feel that pain. there will always be little reminders of my loss, but verse 21 is also a reminder that i can be hopeful in Him because He is faithful + merciful. it took us a couple seconds to process what our doctor had just said. not ten minutes before, i had showed jared the ultrasound pictures from my scan earlier that morning. up until that horrific moment, i had no inclination or physical signs that anything was wrong with our baby. at nine weeks and one day, i knew we were close to being out of that danger zone. i didn't think twice when the ultrasound tech didn't listen for the heartbeat. with jackson, i heard his at seven weeks, but i was too wrapped up in seeing our unborn baby on the monitor. we did not plan to get pregnant so soon, but the shock of it all was finally starting to wear off. i joked with the tech, "there's only one, right?" she indicated so, never letting on that our baby was actually already in heaven with Jesus. we sat in the room with our doctor and cried for awhile. despite having received such tragic news, i was also trying to corral a restless one-year-old. i still had to be his mama in that moment. it was a juxtaposition of sorts. the rest of the evening was a numb blur. waves of grief hit jared + i sporadically. like when i grabbed my phone out of my purse, glancing at the CD of sonogram pictures the ultrasound tech gave me that morning. how cruel, i thought to myself. but she couldn't legally say anything. or how the notification on my pregnancy app was cheerfully reminding me of some random information about the baby. i turned them off because it was yet another painful reminder. i miscarried today. as i'm writing this. right now. and it's . . . words don't come as freely as the tears do currently. the support we have received has been overwhelming. our people have loved us so fiercely in the past twenty-four hours. nothing makes this easier, but having others around to grieve with us helps. in all this, i am not mad at God. i don't blame Him. because what i know to be true about Him is this: He is still good. He is right here with us in this process of healing + moving ahead. He will make something beautiful from the ashes, even if i don't see it this side of heaven. we celebrated jackson's first year over the weekend! since our home is being renovated, we hosted the party at moxie junction in maize. it's a coffee shop, which may sound strange for a one year old's birthday party, but here's my thinking: jackson didn't have any idea what was going on or where he was, so why not make it fun for those of us who are there? a coffee shop sounded like the perfect spot. everyone got free coffee + chatted thoughout the party, so it was a genius plan. the party was wonderful, but no one told me how stressed i would be trying to get everything ready and entertaining everyone and how i would only be able to finally breathe + relax when i got home later that evening. haha! but it was still a great party with family + a few close friends.